Fairbanks is a key player in domestic and international travel and commerce and has some of Alaska’s best weather for flying. Home to over 500 small aircraft equipped with wheels, floats, skis or fat tires, it is not unusual to see a 747 and a Piper Cub on parallel runways. For pilots, Fairbanks International Airport is 94% VFR and 99.5% diversion-free. 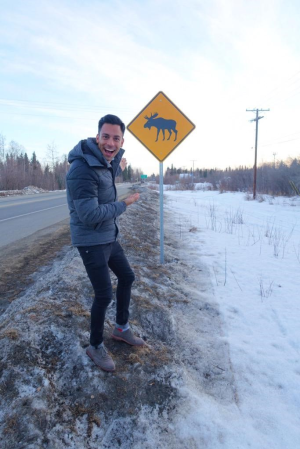 Domestic: Fairbanks is served year-round with direct flights to and from Seattle by Alaska Airlines and Delta Airlines, and seasonally during the summer by United Airlines with direct flights to and from Minneapolis and Chicago. Each airline that services Fairbanks offers a variety of connecting flights that make getting to Fairbanks easy from anywhere in the US as well as international destinations. 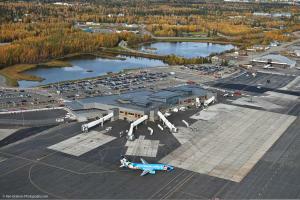 International: Fairbanks is, by far, the smallest US market with non-stop flights to both Europe and Asia. German airline Condor offers once-weekly passenger service during the summer season between Fairbanks and Frankfurt. Japan Airlines and other carriers offer seasonal charter service in the winter from Japan-based and other airports, and China Airlines recently launched direct winter charter flights from Taipei (Taiwan) to Fairbanks. Regional: Several regional air carriers, including Ravn Alaska and Warbelow’s, provide frequent air service between Fairbanks and numerous Interior Alaska rural communities, Anchorage, other Alaskan communities and Canada. The last full-service railroad in the United States, the Alaska Railroad provides daily summer service and weekend winter service (biweekly during the last week of February through March) between Fairbanks and Anchorage, a magnificent twelve-hour train ride. Summer service includes a stop in Denali. To get around town, rental cars, shuttles and taxis are available in addition to the Fairbanks MACS Transit Bus System. Statewide shuttle companies provide daily transportation and charter services throughout Alaska and the Yukon. Cars, trucks, vans and motorhomes can be rented in multiple locations. Gravel road rental cars and campers are available from specific vendors for Dalton and Denali highway travel. The Parks Highway (#3) links Fairbanks and Anchorage, a 360-mile or 6 1/2-hour drive in the summer, and goes through Denali National Park. The Alaska Highway (#2) is a fully paved highway with services about 50 miles apart and serves as Alaska’s main road artery to the Lower 48. The Richardson Highway (#4) is the home stretch of the Alaska Highway leading north from Delta Junction through North Pole to Fairbanks. The Steese Highway (#6) heads north from Fairbanks towards the White Mountains and the village of Circle, with about one-third of the road paved. The Elliott Highway (#2) heads north from Fox to Livengood. 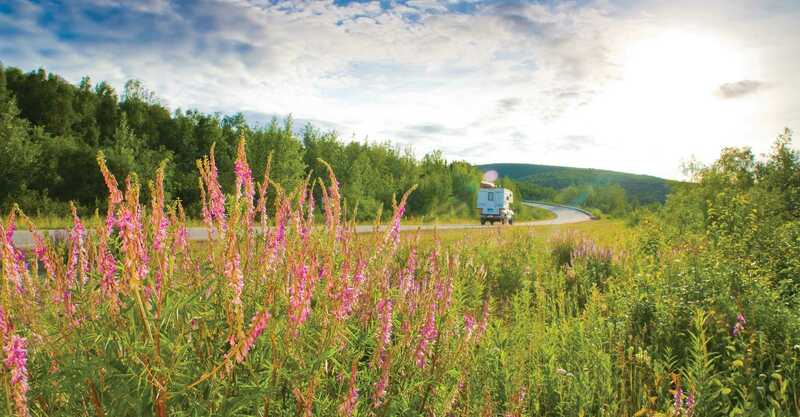 The Dalton Highway (#11), also known as “the Haul Road,” starts at Livengood. Following the route of the trans-Alaska oil pipeline to Prudhoe Bay, the road is open to the public for 496 miles north of Fairbanks. Services are available at the Yukon River and Coldfoot. After Coldfoot, the next services are available 244 miles away in Deadhorse. The best time to drive the Dalton is between late May and mid-September. Motor vehicle liability insurance is required, seat belts are mandatory, children under seven must ride in a child safety seat and helmets are required for motorcycle passengers. It is unlawful to use only parking lights, day or night, when the vehicle is in motion. It is also illegal to drive while operating visual devices or text while driving. All travelers to and from Canada are required to have a passport, a valid driver’s license, motor vehicle registration and proof of liability insurance. The Alaska Marine Highway System (AMHS) has been operating year-round since 1963. A number of vessels offer scheduled passenger and vehicle service to 35 communities in Alaska, plus Bellingham, Washington and Prince Rupert, British Columbia. Amenities such as staterooms, food service and observation lounges vary on each ship. After arriving in Alaska via AMHS, it is popular to continue north to Fairbanks and Denali via road or rail.